Imagine collaborating with colleagues across schools, visiting their classrooms, and engaging in professional learning conversations before, during and after the class visits. It sounds great, right? Except when you consider the time and logistics necessary to make it happen. Enter Google Hangout and Periscope! The result? Professional Learning conversations and class visits connecting two--or more--schools virtually. That is just what we did this week in the Collab Lab! The idea came about earlier in the year when Bridget Wilmot, the Instructional Technology Coordinator from Riverside Brookfield High School, visited EG. She and I exchanged examples of the ways we facilitate professional learning in each of our schools. We discussed the culture of peer observation at EG, and that led to the idea to do a virtual peer observation connecting two small groups of teachers at each of our schools. In order for all of us to meet each other and have a conversation prior to the classroom visits, we used Google Hangout. From there we connected on Periscope to live stream from the classrooms. Periscope, which functions much like Facebook Live, would allow our virtual visitors to comment and ask questions real-time. However, we ended up doing our live back-channel conversation via Google Hangout chat, since we were already connected, and that way, Rachel Barry could moderate the chat while I concentrated on the live streaming. Also, for this first visit we decided to create a private group, rather than stream publicly. First, we went to Kim Miklusak's English class and, in a variation of a socratic seminar, we saw a student-led discussion on the novel Sula. Using guiding questions, students on the inside circle engaged in dialog, while students in the outside circle commented, offered feedback and asked questions via a Schoology discussion, which was projected on the large screen. 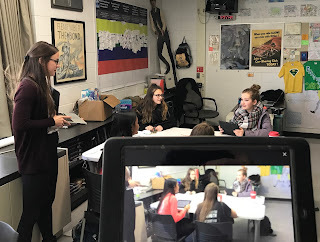 In the photo below you can see me live streaming, and Rachel nearby monitoring and responding to the questions and comments from the RBHS teachers. 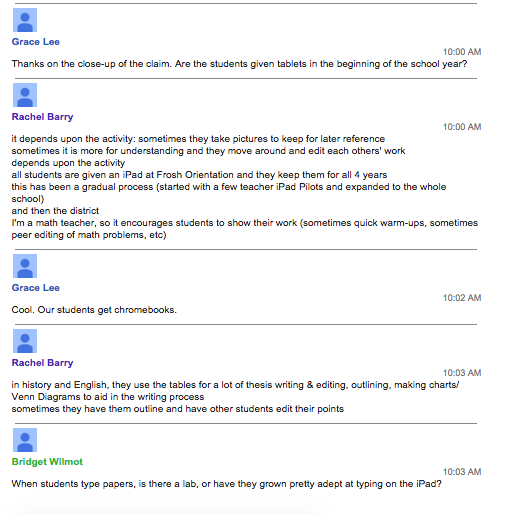 Below you can see an excerpt of the back-channel conversation with varied comments and questions from the RBHS teachers with Rachel's responses. From Kim's class we went to Mark Heintz' World History class. Mark's students were engaged in a collaborative activity on Mercantilism, analyzing documents and finding evidence to support their claims. While the students discussed, Mark circulated from group to group to monitor the conversations, answer questions and offer feedback. Check out this short video clip from Mark's class to give you a better of an idea of what the streaming, moderating and class discussion looked like. Following the two class visits, about 10-15 minutes each, Kim and Mark enjoyed connecting again with the 4 teachers from RBHS, again via Google Hangout. They shared feedback and exchanged ideas that included lesson design and scaffolding, creating and curating digital curriculum materials, focusing on essential skills and giving formative feedback, integrating technology and non-tech methods to facilitate collaboration, and making connections across courses with literacy skills. Such a rich professional learning conversation! Furthermore, some of the participants, who used Periscope or Google Hangout for the first time, left with ideas for integrating th0se technologies in their own classrooms. This was our first experience doing a virtual peer observation in this way, and for all of us it was a positive an energizing experience. We're looking forward to continued collaboration with RBHS and connecting again via Periscope to visit some of their classes. We're also very excited about the possibilities to connect in a similar way with our colleagues across District 214. We've already discussed some possibilities. For example, imagine you are a teacher who teaches a singleton course and you don't have a PLC to collaborate with. You could connect with and observe the same class of a colleague in another school! Just as students benefit from seeing models and examples of work, so too can we benefit from seeing strategies in action, made even more possible via virtual class visits and conversations across schools. Are you interested in connecting in this way? Want to learn more or have an idea to share? We'd love to hear from you! The best time comes in a person life is when its baby arrive in the world. Nothing can beat such college essay service which is completely superlative, person goes in a different state of mind which cannot be expressed in words.